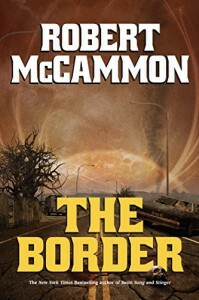 As a HUGE Robert McCammon fan, I was beyond excited when I read that he was writing an epic science-fiction/horror book. (I will probably faint when I finally get the signed copy I ordered from Cemetery Dance.) Overall, The Border did live up to my expectations. The characters here were all well drawn except, oddly,for the main protagonist, Ethan. I felt that we never got to know him in-depth. As we started learning who Ethan was, we discover he's being taken over by The Guardian, and then before we know it the real Ethan is gone. To little or no fanfare, I may add, which felt wrong to me. I loved the sci-fi bits of the war between the Cyphers and the Gorgons. The Gray Men were beyond scary as was just the thought of living in a world caught between warring space factions. The imagination that could think all of this stuff up is worth worshiping, IMO. Some of these creatures and their modes of transportation were amazingly vivid. Now here's the part I don't want to even give voice to: I disliked the ending. A lot. It did not ruin my reading experience as a whole, but it brought my rating down by one star. I hate, yes-HATE, deus ex machina endings and this is surely one. In the midst of discovering one of the greatest tragedies of mankind, comes this fancy gadget to save the day. Really? All of this wonderful creative imagination and then that to end it? I was SO disappointed. Overall, I was pleased with The Border and happy to see the Robert McCammon from the 80's with whom I originally fell in love. His passion and love for his characters is still evident and I love him for that. If it weren't for that ending, this would be yet another book for my McCammon favorites shelf. As it stands, this was still an excellent book-and I do highly recommend it!